A shortage of B vitamins can lead to fur problems, nervousness and lethargy. 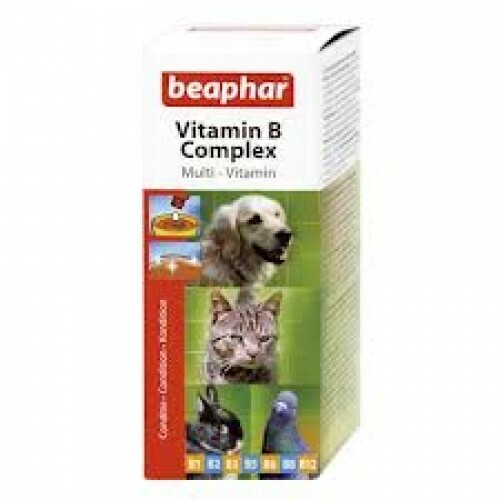 Vitamin B-Complex ensures a healthy coat, proper functioning of the nervous system and a healthy metabolism. B Vitamin helps cats and dogs to avoid problems such as stress, dull coats and subsequent hair loss. B Vitamin also helps birds encourage good feather development and helps build up resistance to disease. B Vitamin is especially recommended for use before, during and after moulting, illness or antibiotica treatment. Water, vitamin B complex sugar and honey. Crude protein 0.9%, ash 0.08% to, 63.7% water.